Kazakhstan is the world’s largest producer of uranium, but has announced it will cut production by 10 percent in 2017. If the uranium industry wasn’t struggling enough, Kazakhstan–the world’s largest supplier of the commodity–announced it would be cutting production in 2017 as a result of oversupply. According to the World Nuclear News, 2017 production will be 2,000 tons less than initially planned for, which results in a three percent global reduction. In 2015, the country produced 23,800 tons of uranium, which accounted for approximately 39 percent of global production. Previously, Kazakhstan had planned to increase production to 2018. The publication also notes that the country’s mines are 100-percent owned, or run through joint ventures with KazAtomProm and international partners. According to Kazatomprom, overall production will be down 10 percent, but production levels for each mine and joint venture have yet to be determined. “While the outlook for nuclear energy growth continues as strong as it has been for many years, the realities of the near-term uranium market remain in oversupply,” Askar Zhumagaliyev, chairman of Kazatomprom, said. In a note to clients, Cantor Fitzgerald analyst Rob Chang said the news is a “game changer” in the uranium space. Chang further added that reduction levels will vary, and were approved by management boards. 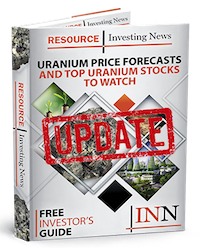 Joint ventures include Cameco’s (TSX:CCO) Inkai mine, which anticipated production of 5.8 million pounds of uranium in 2017 prior to the announcement. “We view this as an inflection point in the uranium space as Kazakhstan has relentlessly increased production from 46.3 million pounds in 2010 to 61.9 million pounds U308 in 2015,” Chang said. Despite the production cutback, Kazatomprom said it would “continue to lead global uranium production and support the growth of nuclear energy around the world.” That said, the company has yet to give updated figures for its planned production for 2017. Heads up BEA.v huge drill proven U3O8 sack property.